That said, I know that kids (and parents!) can be apprehensive about home practice. Believe it or not, when it comes to speech just five minutes a day of practice can make a HUGE difference on how quickly your child makes progress. 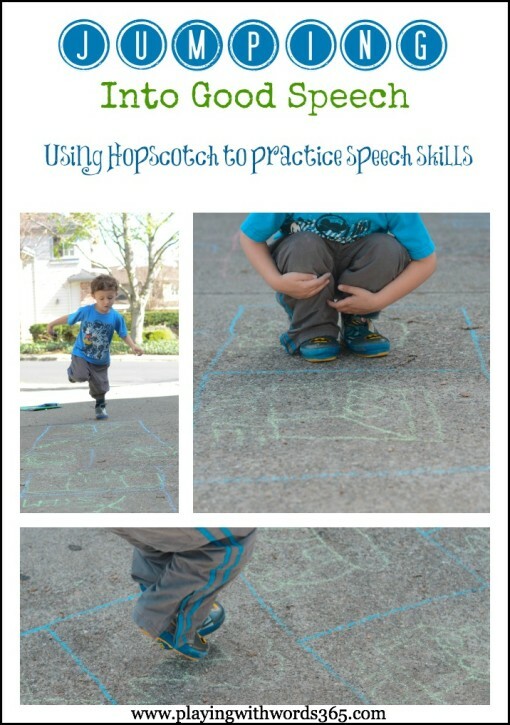 My goal is to share with you quick and FUN activities to do at home to practice your child’s speech goals for ages 3 and up. I hope you find them as much fun as my own son does! So, here we go! Have your child take their rock/beanbag and toss it on the course on a square. Whatever word they land on they need to say 5 times before they jump the corse. Keep going until all words have been practiced, and the game is over. If you have a non reader and you are not much of an artist, you can take picture cards and just place them on the squares. 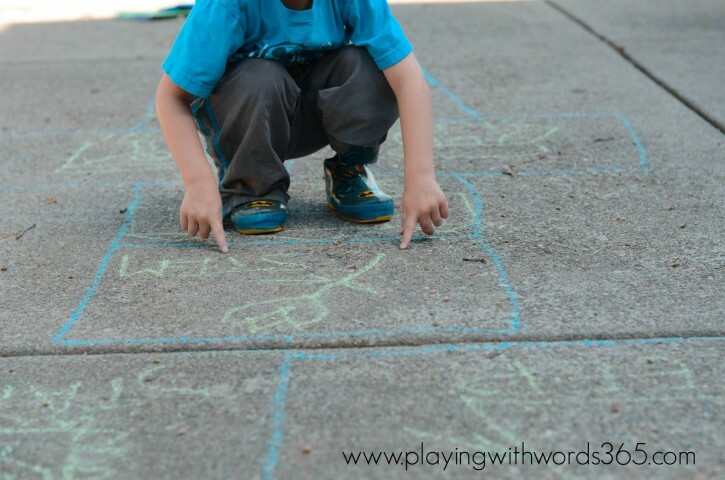 Rather than write/draw pictures of the target words, write numbers in the squares. Have your child toss their rock/beanbag on the course. Whichever number they land on, is the number of times they say their target word (or the number words they must say) before jumping through the course. Once they do all the numbers, the game is done. 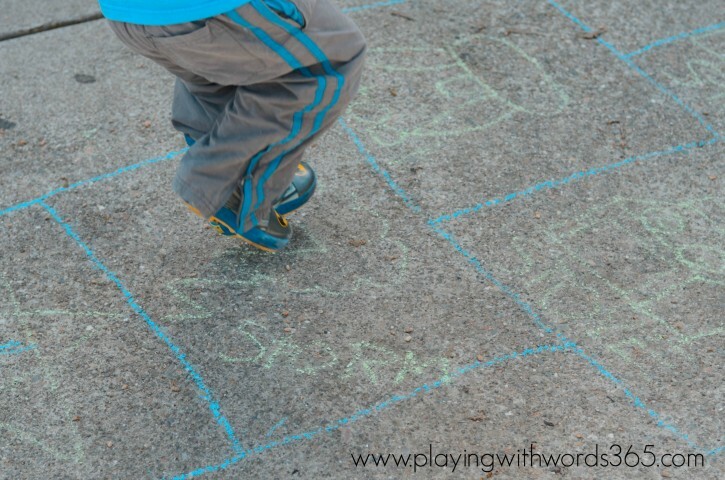 If it is raining, or snowing or just plain cold out, you can do this activity indoors by using painter’s tape to make a hopscotch course on your indoor flooring. Listen carefully to your child to be sure he/she is producing his target sound(s) correctly. For example, if he is working on /st/ blends (like my son was above) listen carefully to make sure your child is saying both the /s/ and the /t/ sounds in the words. If not, say the word for him/her while exaggerating the target sound (the sound he is supposed to be practicing) and have him say the word again correctly. If you find that your child is having great difficulty saying the words correctly with you, talk to your SLP. Either he is not ready to be practicing without the SLP yet, or the SLP can give you some specific cues you can use to help your child. Try to have your child play the game for 5-10 minutes and say as many words correctly as you can.